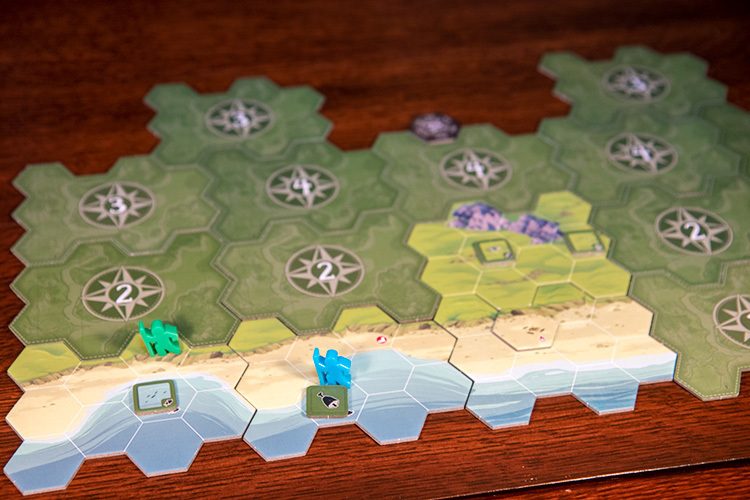 We review Discover: Lands Unknown, a semi-cooperative exploration board game published by Fantasy Flight Games. 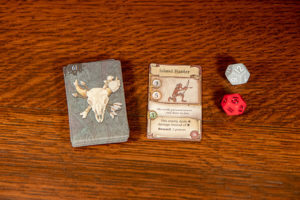 Part of FFG's "every game is unique" system, no two copies of Discover will ever be the same. 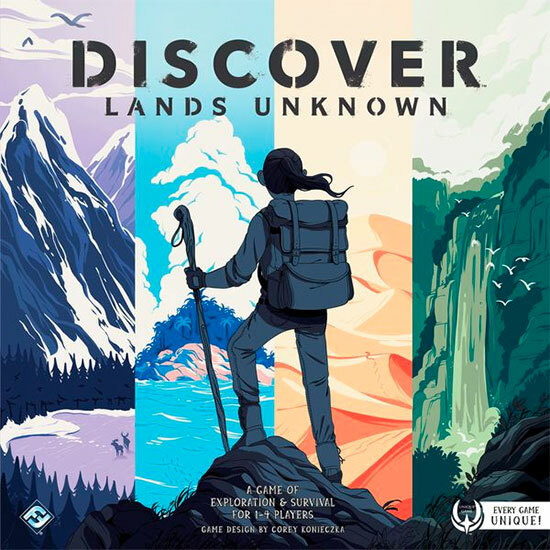 Well it didn’t take them long to bring that formula to another game in the form of Discover: Lands Unknown. This time, instead of a dueling game, they brought us a semi-cooperative exploration game. Did the “every game is unique” formula translate well to a thematic exploration game? Let’s find out. 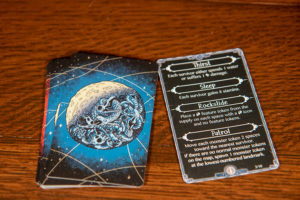 Each game of Discover: Lands Unknown (hereafter referred to simply as Discover) is completely unique. 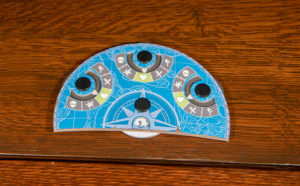 The box will contain two out of a possible 4 terrain types, and all characters, cards, and tokens are a random combination from the total pool of potential choices. Each character has a special ability. While the mixture of components are unique, the gameplay in each copy works the same. 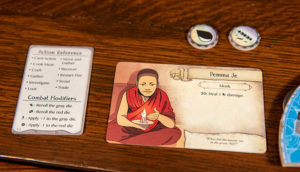 Players will choose one of five different scenarios to play, but most involve them waking up in an unknown land, looking for an escape. On a player’s turn, they may spend stamina to do a variety of actions: move, explore, craft, gather, hunt, encounter, etc. Some terrain have different stamina requirements, and landmarks will provide story encounters from cards. Any combat is handled by rolling two dice. One to see if you hit the monster and one to see if it hits you. Players can take damage from combat, thirst, starvation, or poison. If a player takes a fourth damage of any type, they die and are eliminated from the game. After each players has spent all their stamina, a night phase happens. These will let players know what bad stuff happens, refill some gather spots, and replenish their stamina. The game ends when either all players are dead, or they have successful completed the scenario’s goal. Each map is made up of 15 tiles, usually arranged this same pattern. While I’ll get to the gameplay in a minute, you can’t take about Discover without mentioned the “every game is unique” factor. I was skeptical about it when Discover was first revealed, and it turns out apprehension was well deserved. 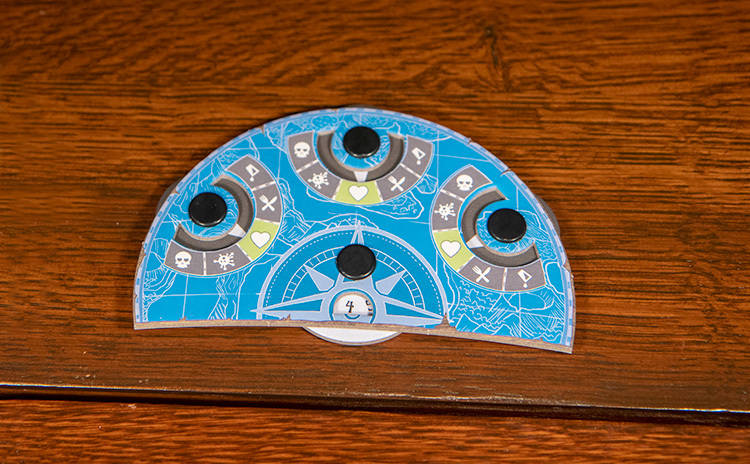 I can easily make a case for why this Unique system works for a game like KeyForge. But for Discover, I simply can’t. I just didn’t see any tangible benefit for my copy being unique. This is primarily because my copy will never interact with another version of the game. Your copy will have different lands, characters, and encounters then mine…OK. Without the two copies ever actually meeting up, it doesn’t seem to matter. Night cards will replenish resources and stamina, but also might have bad events. What I really feel like is that I got an incomplete game. FFG went through the trouble of play testing all these elements and I only got a fraction of them. The unique feature feels like nothing more than a marketing gimmick to try and get people to buy more than one copy of the game. If I could take my copy and connect it to yours in some way, I could get behind that. But as it stands now, the “uniqueness” is an afterthought at best. OK, now that we have that out of the way, let’s get to the game play. One thing I liked about Discover was how streamlined the mechanics are. I liked the stamina system, which allowed for quick turns and a flexible amount of options. If I want to move here, gather this, and craft that, I simply pay the number of stamina points. Easy enough. I also found crafting upgrade to be one of the more enjoyable parts of the game. I always like improving my character through various tools and items I could make. Unfortunately, the crafting deck was really small, and by two games, I had seen every possible item I could make. More variety here would have been greatly appreciated. But again, I was limited to a handful of cards in my unique copy. If a player takes a fourth point of damage, they are killed and out of the game. For the exploration, you have about 15 tiles in total, but most feel pretty much the same. Every tile has around 1-3 gather spots, with an occasionally landmark location. Frankly, most of the time I felt like I was moving off one tile and back on to an almost identical tile. Combat is handled by rolling two dice and comparing them to the monster’s numbers. Finally, the game is also really random. Combat is handled via two dice rolls. Without items, it’s basically roll and pray. However, most of the time you just want to avoid combat all together, especially with monsters. Combat damage is the only type that you can’t heal, and a fourth point of damage eliminates you from the game. Why FFG thought player elimination was a good idea in a 60+ minute game is beyond me. Especially how random it is taking damage. A player could be out quickly and then get to watch for 30 minutes. 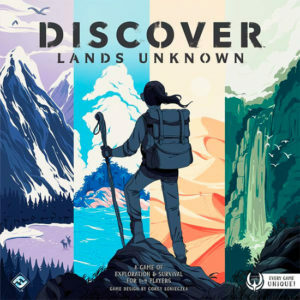 Discover: Lands Unknown sets itself up to be a game that I would really enjoy as I love exploration games. Starting in a small territory and exploring a new world is a game I just gravitate to. Especially when you throw in some character building. However Discover: Lands Unknown had no sense of wonder in its exploration. And with a story that’s completely forgettable, there was nothing left to keep the player’s interests. If you are looking to give Fantasy Flight’s “Every Game Unique” system a spin, I recommend you go try KeyForge. At least there it makes sense. Discover: Lands Unknown is not only dull, but feels like I bought an incomplete game. 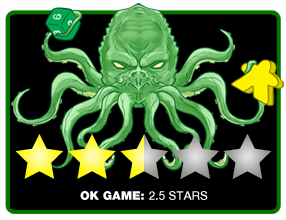 Final Score: 2.5 Stars – A game that had a lot of potential, but the “uniqueness” ended up being more of a hindrance than a benefit. • Only two terrain types with repeated setups. There has been negative press about this game. So it’s unsurprising about the review. I payed this game for the first time this weekend. My copy came with the island and snow areas. On one hand, I actually really enjoy the exploration and survival aspect, on the other hand, I agree with Tony that the game feels incomplete. I’d gladly had paid an extra $10 to have the desert and mountain areas included as well. Basically $60 for everything would have been A-OK with me. This does come across as a sleazy way to encourage people to buy more than once copy of the game. I hope FF eventually releases expansion packs for this game that let players buy the portions they are missing. And I hope FF never pulls this sort of shenanigans again with future board games.